Let's face it, just like people, dogs experience gastrointestinal issues every now and then. Whether it's a digestive matter, loose stool, or some not-so-pleasant odors, the issues are real and there are all-natural remedies available. 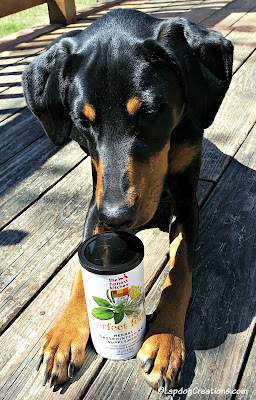 Disclosure: The Lapdogs are Chewy Influencers and received a jar of The Honest Kitchen Perfect Form, free of charge, in exchange for spreading the word about the product and Chewy. We only share information that we feel is relevant to our readers. All opinions expressed are our own. The Lapdog household is no different than yours. We have experienced all of these issues from time to time, and we have been using the typical remedies - probiotics and pumpkin puree - to counter-act them. So when our friends over at Chewy recently asked if we wanted to give The Honest Kitchen's herbal gastrointestinal supplement a try, we immediately said yes. 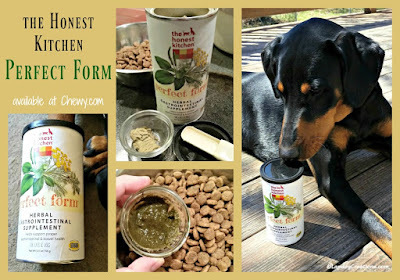 The Honest Kitchen Perfect Form is a herbal nutritional supplement that supports the healthy functioning of both dog and cat's digestive tracts. Not only does it soothe and protect the GI tract while facilitating regularity, the all-natural supplement also aids in reducing loose stool due to environmental stress, dietary indiscretion or the transition to a new diet. As if that weren't enough, Perfect Form helps with gas and regularity issues - something all of us pet parents can be thankful for! Perfect Form is a proprietary herbal blend of papaya leaf, plantain leaf, slippery elm, pumpkin seed, and fennel. It does not include any added salt, sugar, by-products, preservatives, or chemicals of any kind. In fact, there are literally no inactive ingredients in Perfect Form. Unlike some other methods, Perfect Form can be fed directly or mixed with food. 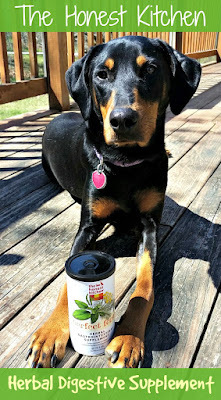 Equal parts of the supplement and water are mixed together to create a gel, which I then mixed into Penny's kibble. Sure, it's an extra step compared to the other methods we used, but I don't mind. Penny has been taking probiotics on a regular basis to help combat her occasional loose stool issues, so I'm excited to see how she does on Perfect Form. I'm not sure if we'll make a permanent switch yet or not - but time will tell. In addition to the regular pet GI issues, Perfect Form is also ideal for dogs or cats with IBS (Irritable Bowel Syndrome) or Colitis. You can find Perfect Form at Chewy where 1-2 day shipping is always free on orders over $49... which means your dog or cat will be extra happy when you also add some treats or food toppers from The Honest Kitchen to your cart before checking out! Jeff has "issues" with Tank, so I'll recommend this to him. Thanks! I love both Chewy.com and Honest Kitchen. I have seen some of these new mixes, but have not tried that one. I'll have to give it a shot! Great job on the review, I saw this item, but wasn't sure if it would work. But The Honest Kitchen is such a great company, we always feel you trust in the quality of their products.